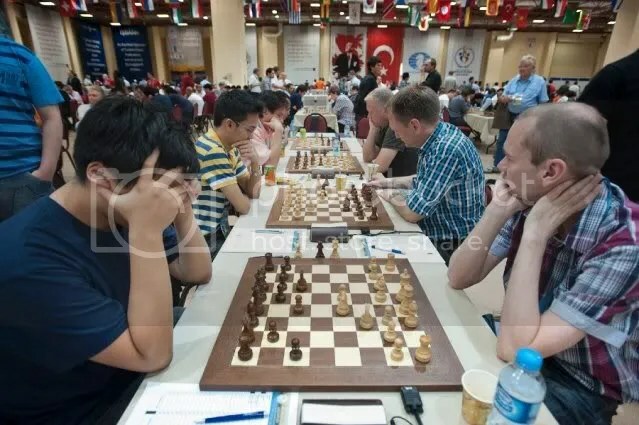 Round 5 of the 40th Chess Olympiad was a Battle of ‘Powerhouse Teams’ as described by the Olympiad’s website where the 2-time Olympiad Champion Armenia (2006 & 2008) locked horns with the defending champion Ukraine (2010). Team Armenia prevailed where the feat of the teams was determined in the top board match between Armenia’s World #2 Levon Aronian and World’s #9 Vassily Ivanchuk of Ukraine, a decisive game in the match, where Aronian triumphed and provided the Armenians a 2.5-1.5 narrow victory. Team Philippines(Open) who also suffered the same feat, a 1.5-2.5 loss in the hands of Team Armenia in R4, this time managed to regrouped and extracted a decisive win over Iceland with a 3-1 score in Round 5. Team Philippines(Women) likewise managed to equal Team Philippines(Open) results by scoring a 3-1 win over South Africa in Round 5. Going into Round 6, with Team Philippines(Open) 11th position in current standing will be facing another ‘chess titan‘ … #10 seed Team Bulgaria. Team Bulgaria is manned by no-less than its top board player Hyper-GM Veselin Topalov (2752), FIDE’s 2005 World Chess Champion & 2010 World Chess Championship challenger. Boards 2 & 3 are manned by 2 Super-GMs (2600+) and a pair of 2500+ GMs in Board 4. Indeed another super-titan opponent in Round 6. Team Philippines(Women) currently at 13th position after 5 rounds, will be facing the Titanesses of the 14th seed France. So far, Team Philippines (Women)‘s Bo.3 Janelle Mae Frayna is the highest points contributor for the team with 4.5/5 (4Wins & 1Draw), with No-Loss record. Brd-1 WIM Catherine Perina has the highest Rating Performance (Rp) with 2229 from her 4.0/5 (4Wins & 1Loss) record. Another top performer & contributor with a No-Loss record is Bo. 5 Jodilyn Jan Fronda who contributed 2.5/3 points (2Wins & 1 Draw). Bo. 4 Jedara Docena scored 2.5/4 (2Wins-1Draw-1Loss), while Bo. 2 WFM Rulp Ylem Jose scored 1.0/3 (1Win & 2Losses) point. For Team Philippines(Open), Board 2&3 GMs Oliver Barbosa & Mark Paragua are the Team’s top points contributors with 4.0/5 (3Wins & 2 Draw) each. Bo. 1 GM Wesley So has the highest Rating Performance (Rp) of 2719 from his 3.5/5 (2Wins & 3Draws). IM Oliver Dimakiling had contributed 3.0/4 (3Wins-1Loss) points with a Rating Performance (Rp) of 2631 & still a candidate for his 3rd & final GM norm. But he still needs at least 5 more games (9-rounds minimum requirement according to 1.24 FIDE handbook) to play & an Rp of not lower than 2600, a tall order. 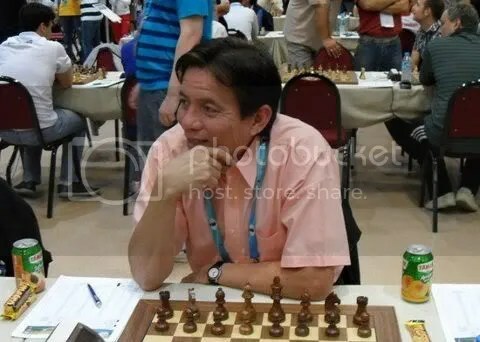 AFGM Eugene Torre in his Round 5 draw appearance at Bo.3, officially had registered his 21st Olympiad participation that broke his own record and that of Hungary’s GM Lajos Portisch‘s 20 World Chess Olympiad participation as a chess player. 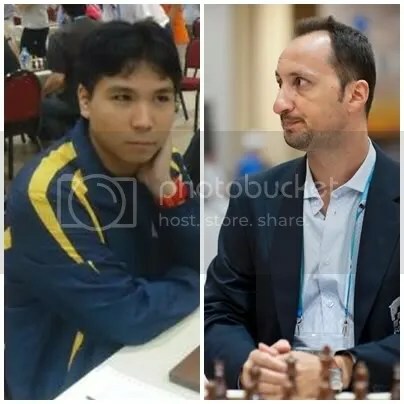 The most exciting game to watch between Team Philippines & Bulgaria will once again on the Top Board, where GM Wesley So playing the white pieces, will put his “No-Loss Record Vs GMs with 2700+ rating“ on the line for the 35th time against FIDE’s 2005 World Chess Champion & 2010 World Chess Championship challenger GM Veselin Topalov (2752). 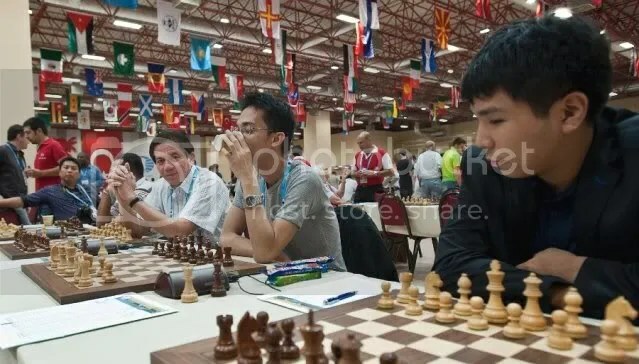 This would be the 2nd encounter between the two chess warriors, where their 1st encounter that ended with a draw, took place in Round-8 of the previous 2010 Chess Olympiad in Khanty Mansiysk, Russia. For Dimaks last GM norm it should still be 9 games where he needs a rating performance above of 2600. There is a special condition that if he plays less than 3 GM and 5 titled players he gets 13 games GM result (defined as GM performance by FIDE) or if he plays more than 3 GM and 5 titled players he gets a 20 game GM result (known as GM norm). The 7 game GM result is only applicable to continental/world team championship and world cup as stated in http://www.fide.com/fide/handbook.html?id=58&view=article see under section 1.24 and 1.4. 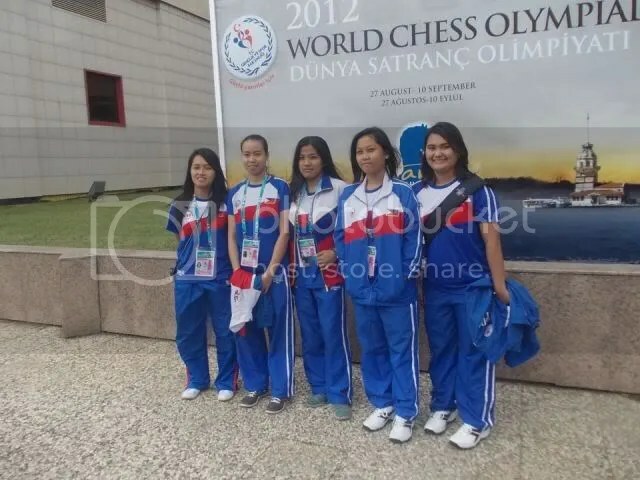 Actually, i’m researching on ‘World Team Championship’ … all the way i thought Chess Olympiad since it is a Team Championship is also considered as one but there is really a separate World Team Championship. In that case then, FIDE’s 1.24 will prevail for the Olympiad GM norm … ≥9 games GM Performance counts as 13 games; ≥9 games GM Norm counts as 20 games.